Distant wars are coming home to roost. People are leaving the country in droves to escape the mushrooming violence. The unrelenting doom menaces Della, a 27-year-old waitress who works in a vegan cafe in some alternate America. To jolt the bourgeois out of their complacency, she begins calling in fake bomb threats. A bomb threat, she reasons, is like Mom saying you’re in trouble, but not telling you why. It forces you to catalog your misdeeds. When real explosions begin striking her list of targets, however, Della is drawn into a world of disturbing consequences. Della is the narrator in Zazen, a literary novel by Vanessa Veselka in which exquisite turns of phrase entwine with an engaging story about survival in a world gone wrong. 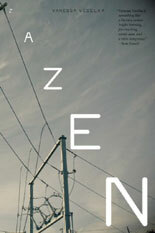 “Zazen has a power beyond the satire and the clever reimagining of today’s counterculture trends,” reviewer Katie Schneider writes in the Oregonian. “It also has heart and soul.” Judy Krueger in the New York Journal of Books calls it “a streaking flash of barbed satire and 21st- century malaise.” The book is one of five finalists for the Ken Kesey Award for Fiction. Born in 1969, Vanessa grew up in Manhattan, the daughter of a prominent journalist and a communist cowboy Marine. She toddled off to 30 Rockefeller Center after school to nap in the green room. By the time she was tucked into bed, it was often 3 a.m. Although she grew up in a world of privilege, meeting celebrities in five-star restaurants, there was turmoil at home. Vanessa had a rebellious streak. Expelled from high school for truancy, she left home when she was 15 and hitchhiked across the country with her boyfriend, a 21-year-old petty thief who had jumped bail from Rikers Island. They picked up odd jobs in New Orleans and roamed up and down Interstate 10 looking for seasonal farm work. They parted ways outside Gila Bend, Arizona. Vanessa dug ditches near Dateland, sold flowers on freeway onramps in L.A., and surfed couches in Spokane. She inhabited a twilight state of sleep deprivation, bedding down under bridges and in squats. Hitching rides with long-haul truck drivers provided snatches of sleep, lulled by the thrum of the engine. But Vanessa’s eyes would pop open with every shift of the gears, alert to potential danger. When she was 18 years old, she bought a one-way ticket to Europe, drifted through Turkey and Yugoslavia, strumming her guitar on street corners, until she wound up in Vienna. There she formed her first band, the Remnant, which gained critical success and opened for the Ramones and Faith No More. During a walk along the Oregon coast, it hit her. She loved rocks; for years, she had dreamed of returning to school to study geology. Tired of being a dilettante (who hopes to rescue that word from ignominy), she decided it was time to make her fantasy a reality. 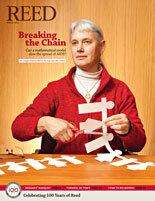 Needing to stay in Portland to share parenting duties with her ex-husband, she had one obvious choice: Reed College. 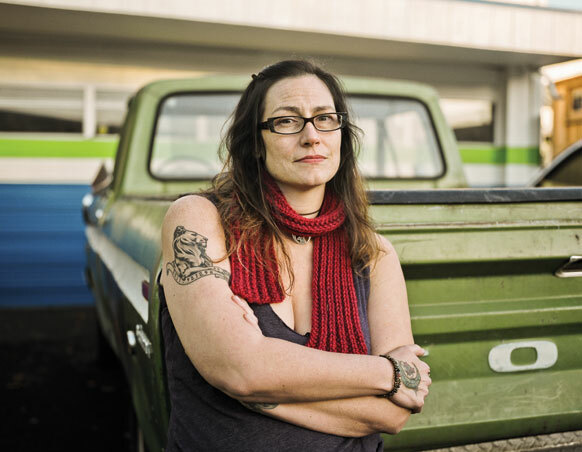 High school dropout, former teenage runaway, rock musician, union organizer—Vanessa’s résumé was anything but conventional. Nonetheless, her intellectual passion leaped off the pages of her application. She also carried the strong endorsement of paleontologist Peter Ward and astrophysicist Mark Hammergren, two scientists she worked with at UW. Reed admitted her in 2004 with a full scholarship. Vanessa was thrilled. She was also 36 years old with a toddler in tow. Study groups in chemistry, her intended major, tended to meet in the dorms at night—long after she’d picked up Violet from daycare. Though the DoJo now offers tutoring during class hours, at the time there was no math or science tutoring until 7 p.m. Worse, chemistry requires calculus, and taking calculus at Reed with no preparation in trigonometry, geometry, or intermediate algebra proved disastrous. “I was actually doing really well in chemistry but, like Alice after the rabbit, I was chasing calculus down a hole,” Vanessa remembers. She hit the books every night, valiantly trying to overcome the deficiencies in her preparation through sheer force of will. She had never worked harder. But she could not catch up. Her final grade for the course was a D.
It was time to stop fooling herself. She switched her major to English and decided to pursue something she was actually good at—writing.